Counting down the days until the next plunge? Four months is a long time to wait, but lucky for you, the Penguin Plunge has some fun events planned for the month of November as we prepare for the big day! 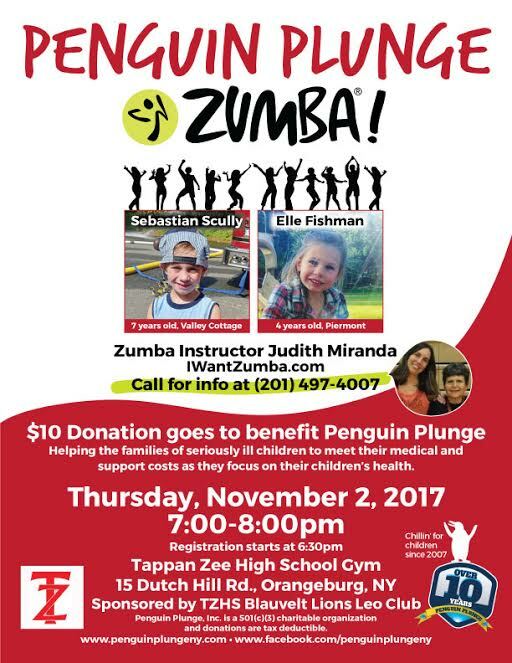 To kick-start our events for this month, the Penguin Plunge will be hosting Penguin Plunge Zumba at Tappan Zee High School on Thursday, November 2nd. The event is from 7:00–8:00 pm, and registration begins at 6:30 pm. There will be a $10 donation to participate, which goes towards benefiting the Penguin Plunge. So throw on those dancing shoes, and come join us as we dance for a cause! You can never go wrong with a little Sunday Funday! Faced with a long week ahead why not enjoy yourself with free entertainment, raffle prizes, and some tasty booze – as long as you are 21 of course ;). On Sunday, November 19th you can find us at Growler and Gill for Musician Guest Bartending! One of the best things about November is Thanksgiving. The day of giving thanks, spending time with family, and feasting till you can feast no more. Can’t get much better than that huh? What about a second feast? Only this time you will be feasting to help those in need! This #GivingTuesday, November 28th, the Penguin Plunge will be hosting our very own post-Thanksgiving feast at Bailey’s Smokehouse! #GivingTuesday is the national day to celebrate and encourage giving as we approach the start of the holiday season. All proceeds will go towards The Penguin Plunge and to helping ill children. So make room in those tummies and join us as we give to those who need it most! Can’t be there with us? You can still make an impact! Click the link below to donate to the Penguin Plunge non-profit organization to help ill children in need!